Rio Tinto mines metals, not coal. Still it’s notable when a mining company threatens action if mining company associations do not act to enforce the goals of the Paris Accord, don’t you think? 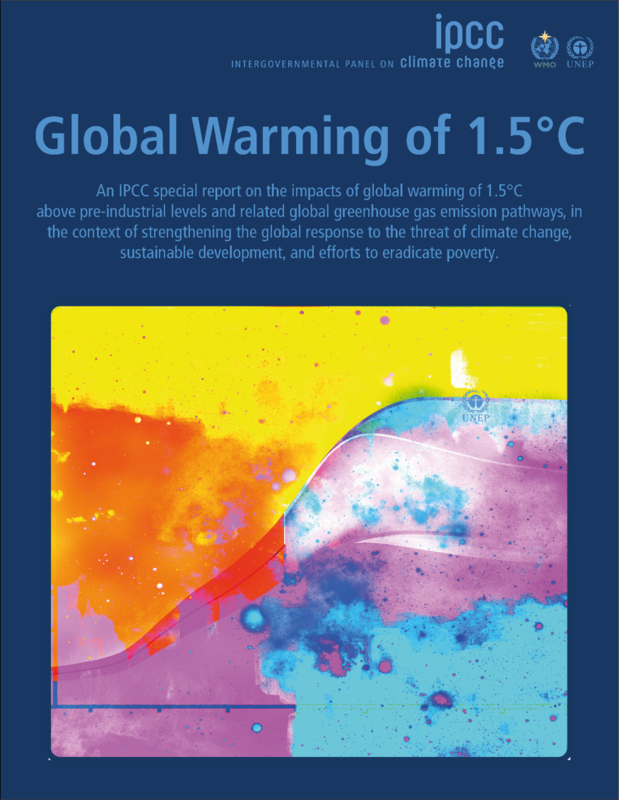 Supporting the Paris targets means advocating for the rapid phase out of coal in line with the latest @IPCC_CH advice on limiting warming to 1.5 degrees Celsius. According to the news article in The Guardian, Rio Tinto’s position has been carefully worked out over the past two years. Rio Tinto has signalled it is prepared to quit its membership of industry associations, including the Minerals Council, if it makes public statements inconsistent with Australia’s Paris climate agreement commitment. The company published a global statement on Thursday night setting out its expectations of the industry bodies it belongs to about commentary they make on climate policy. It includes an expectation that Australian industry associations will publicly argue against government subsidies for coal. The statement comes after more than a year of talks between Rio Tinto and the Australasian Centre for Corporate Responsibility, a not-for-profit group that targets social, environmental and governance issues within large corporations. Rio Tinto published its environmental statement, urging action against global warming climate change, in 2017. Another giant company using natural resources, urging the rest of us to be wise stewards of the Earth. From a project at the University of California at Berkeley, http://www.howglobalwarmingworks.org. Is that simple enough to remember? Is it simple enough to explain to kids? Simple enough to sway a climate change dismissive? As Bill McKibben notes, something seems amiss with this chart. 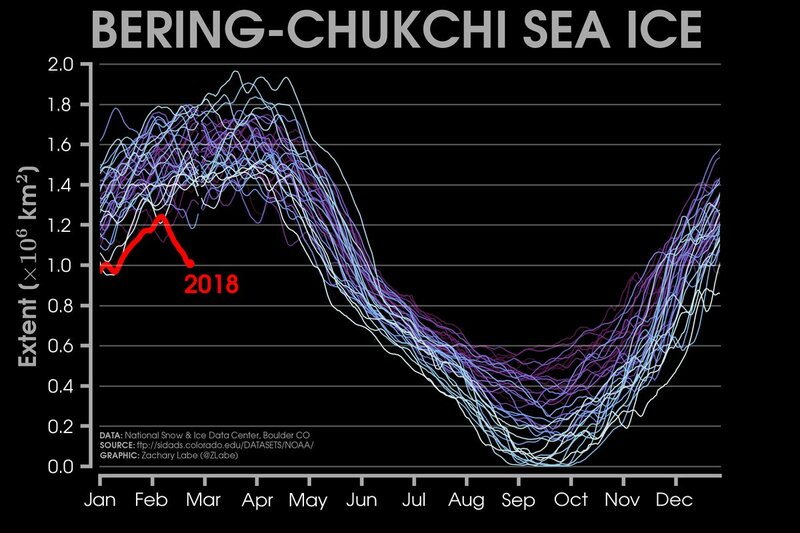 Chart from data from the National Snow and Ice Data Center (NSIDC) showing sea ice in the Bering-Chukchi Sea; 2018’s ice decline in red. Graphic by Zachary Labe. The U.S. National Snow and Ice Data Center in Boulder, Colorado, track ice in the Arctic. The chart shows extent of sea ice in square kilometers, with a comparison of about the past 20 years. In red, you see what is happening to the ice in 2018 — a dramatic melt, a dramatic plunge in the amount of sea ice. Arctic Circle area temperatures rose dramatically above normal temperatures for winter in the past few weeks, by 25 to 40 degrees Fahrenheit (see report in the Sydney Morning Herald). Such dramatic increases frequently result when a weakened jet stream fails to keep cold Arctic air in the Arctic — and the polar vortex slips to give some temperate latitude land incredible freezes. The colds that get reported on the news and touted by science dissenters as evidence Global Warming does not occur, are the result of those heat blobs in the Arctic. Tipping points are not always discernable in real time. This may be an exception. Tip of the old scrub brush to Bill McKibben, of course. How can we not allow undeveloped nations and the poor to use fossil fuel energy? How can we not allow undeveloped nations to catch the first world with fossil fuel energy? Katharine Hayhoe explains at Global Weirding. Spring comes a few hours earlier every year as the planet warms; plants that used to blossom in March and April, now blossom in February. Mexican plum blossoms in Dallas, Texas, February 17, 2017. Photo by Ed Darrell, iPhone 6; please share with attribution. Spring comes earlier every year in Dallas. Our Mexican plums used to blossom in March and April; for the past three years, we’ve had blossoms well before spring even comes. Last year we had a cold snap that took the young fruit out, after a premature blossoming. It’s a sign of creeping global warming. Every year I marvel at Al Gore’s powers to convince our Mexican plum to blossom early, part of the “global warming conspiracy” so many fear. That is, this is a symptom of global warming that cannot be faked, that is from observation, and not from models. With flowers on fruit trees come hopes of a bountiful harvest. Dreading the underlying meaning of such an early blossom does not change our hopes, nor the birds’ hopes, for a good plum harvest. Earth is nearing the end of the the third record-breaking hot year in a row. 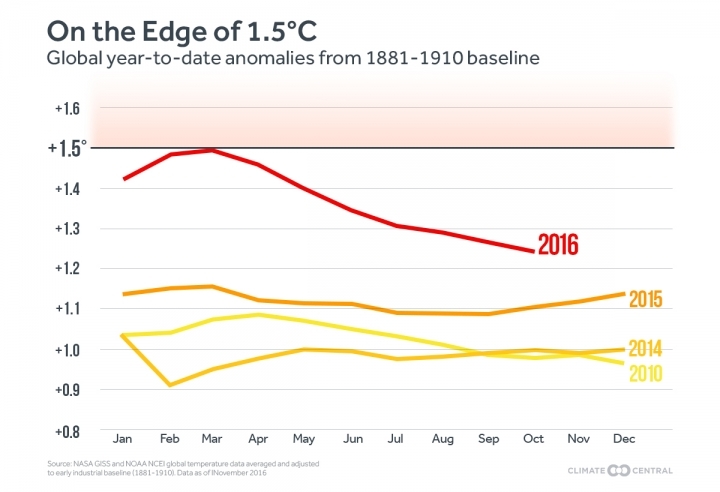 2014 was the hottest year ever, but was beaten by 2015. Now 2015’s heat takes second place to 2016’s heat. 2016’s record-breaking heat too fuel in part from an El Nino through the first nine months of the year; with a La Nina weather pattern developing now, there will be some cooling, but the cooling will not be enough to keep 2016 from being the warmest year ever recorded in human history. Notes on this milestone can be found in several places; Climate Central’s explanation covers it succinctly. The National Oceanic and Atmospheric Administration released its temperature data through the end of October on Thursday and found that for the year-to-date, the global average temperature is 1.75°F above the 20th century average of 57.4°F. That puts the year 0.18°F ahead of last year, the current hottest year titleholder, with just two months to go. “It’s likely that we will end up as record warmest,” Jessica Blunden, a climate scientist with NOAA’s National Centers for Environmental Information, said during a press teleconference. September was the first month of the year to not be record warm (it came in second place), as temperatures began to cool slightly with the demise of El Niño and the move toward La Niña. It ended a streak of 16 consecutive record-setting months, itself a record. Maybe more shocking, it’s been 115 years since we had a record cold year, according to Climate Central. In fact, global temperatures have been above-average for 382 months in a row by NOAA’s reckoning, going all the way back to the Reagan administration. To find a record cold month requires going all the way back to February 1929. The last record-cold year was even further back, in 1911. 382 months. Anyone under the age of 31 has never experienced a single month of temperatures as low as the 20th century average, in their lifetime. A generation has been raised with global warming climate change as the norm. How will that affect voting patterns and public opinion to change government policies? You are currently browsing the archives for the Global warming category.